As a SAHM I often have to get creative with fun ideas to fill up our days. I always have to be mindful of how much each activity will cost, living on a single income and all. Last week Penelope was bouncing off the walls and was bored with her same old color books and sticker activities. I dug around in my art room and came out with an array of paint colors, a glue gun and some googley eyes. The next step was to head outside into the great, wild wilderness (the backyard) and search for the perfect rocks. The PERFECT rocks??? you may ask… aren’t all rocks created equal? The answer is (to me) no. I look at art project rocks like I do clouds. At first they are simply grey, hard lumps…but then as you study them closer things change. You start to notice a nostril in a jutting edge, or a deep, sunken in eye in a round crevice. The rock suddenly becomes something with personality. Penelope and I quickly gathered up our rocks and took them inside. You will first want to wash your rocks and dry them off, or let them air dry. This will help the paint and glue stick to them. After that you get out your paints and brushes and go for it! 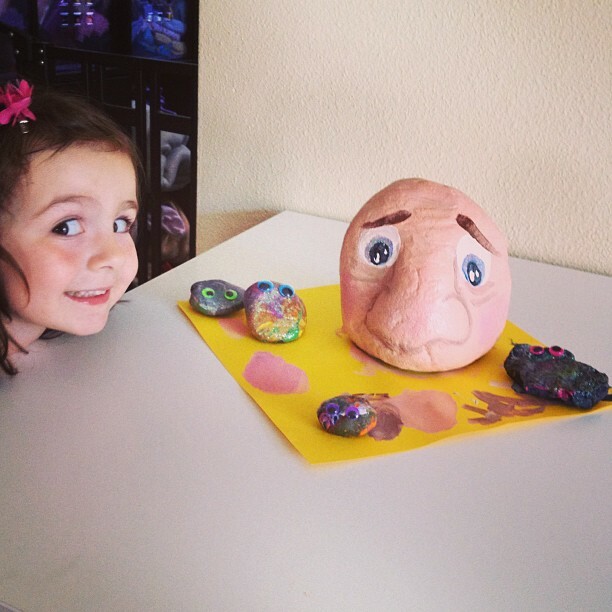 After painting, let them dry, and then you can add embellishments like googley eyes with a hot glue gun (obviously the adult is in charge of this) or mix some clear varnish paint with glitter and make your rocks dazzling as my little girl did. The possibilities are endless and the greatest thing is, once you are done you can use them to decorate your yard! Another fun thing to do with your final product is to take them when you go on neighborhood walks and slyly deposit them in your neighbors yards. One day they will notice them and I’m sure it will brighten their day! Here are the rocks that Penelope and I created (the small ones are hers and the large one is what I like to call my “Garden Creeper”. This entry was posted in Crafts, Saving Money.